Earlier today I was in Boston, where I gave a talk at AstraZeneca (in fact, the exact location was Waltham, Mass). My former student Tim Rasmusson is working there now, so it was great to see him again. Dr. Scott Cowen was my host and he was responsible for bringing me to their site. Throughout the day I met a lot of people and heard a very coherent message, which indicates that macrocycles are among the coolest commodities in today’s drug discovery. One of the reasons Scott brought me over had to do with an ongoing collaboration between AstraZeneca and Encycle Therapeutics (http://www.encycletherapeutics.com), the company I started together with MaRS Innovations in 2012. Encycle now has 8 employees and is in hot pursuit of several proprietary targets in addition to collaborations with AstraZeneca, Merck, GSK, and Pfizer. We will be updating our website soon, so stay tuned! I was encouraged by the warm reception our platform has received at AstraZeneca. This interest provides further impetus for trying hard to reach our milestones. I want to stress that we are working together with an awesome team led by Professor Eric Marsault of the University of Sherbrooke. Together, we are amassing an impressive collection of macrocycles that are being evaluated using a wide range of techniques. I don’t intend to talk about any of Encycle’s accomplishments today, although I can say a lot in praise of the hard work of our team. This will be mentioned in detail once we make some corporate announcements (I hope soon). Instead, I want to discuss an issue that continues to present challenges in the general area of peptide macrocycles. These molecules are substantially larger than their small molecule counterparts. Macrocycles have high polar surface areas due to the presence of multiple amide bonds. This makes it difficult for them to traverse cellular membranes, which is something I noted in the past when I said that control over intramolecular hydrogen bonds is key to reducing the polar surface area of these molecules. logD, or the logarithm of the ratio of the concentration of a given molecule in octanol to the concentration of it in water at a given pH, is one of the metrics that is widely used to assess lipophilicity. logD can be measured experimentally and can be reliably computed, with the caveat that there are big discrepancies between experiment and computation when it comes to molecules that can form intramolecular hydrogen bonds. Incidentally, this problem affects even fairly simple compounds. While visiting AstraZeneca, I was reminded that the calculated logD of the following two molecules is identical, although the experimental values are vastly different due to the presence of an intramolecular hydrogen bond in the first case. If folks are having trouble with such simple stuff, just think about the nightmares you’ll have when it comes to giant rings with rich conformational space. We really need to improve computational approaches in order to enumerate virtual libraries of macrocycles. I guess this is today’s message. Once again, today was a great one-day visit to Boston, so thanks to Tim and Scott (I loved that Venezuelan restaurant!). Au(I) turned out to be the optimal catalyst which, in its typical “alkynophilic” fashion, renders the triple bond susceptible to the attack by the nucleophilic phenoxide oxygen. It is at this point that boron electrophile is generated, which is the most intriguing part of the paper. Due to my lab’s recent interest in the effect of MIDA group on boron transfer reactions, the nature of boron electrophile here certainly piqued my interest. At this point, it is a bit difficult for me to envision B[MIDA] trifluoroacetate (that would be an analog of compound 16) as an effective electrophile. There are some thought-provoking lessons here, in my view. I am at the ACS National meeting in Dallas today, where I took part in the Symposium on Macrocycles. We had a good line-up of speakers, including W. van der Donk, S. Lokey, Allyn Londregan, Keith James, and myself. David Price of Pfizer organized this event, which was a great success (thanks David!). I am writing this post while waiting for David and Scott to go to a steakhouse. Our event took place in the afternoon, but I woke up bright and early and went to the total synthesis symposium, where lectures were presented by graduate students. I always like to hear these kinds of talks because you get to see what actually happened. Today was no exception and there was a very well selected line-up. The talks were both informative and well presented, despite the fact that only a few people were in attendance this early in the morning (perhaps folks had too many margaritas the night before?). In every synthesis endeavour, there comes a point that defines one’s problem-solving abilities. I am making a subfield-agnostic statement, but such defining points are perhaps best illustrated by way of total synthesis. 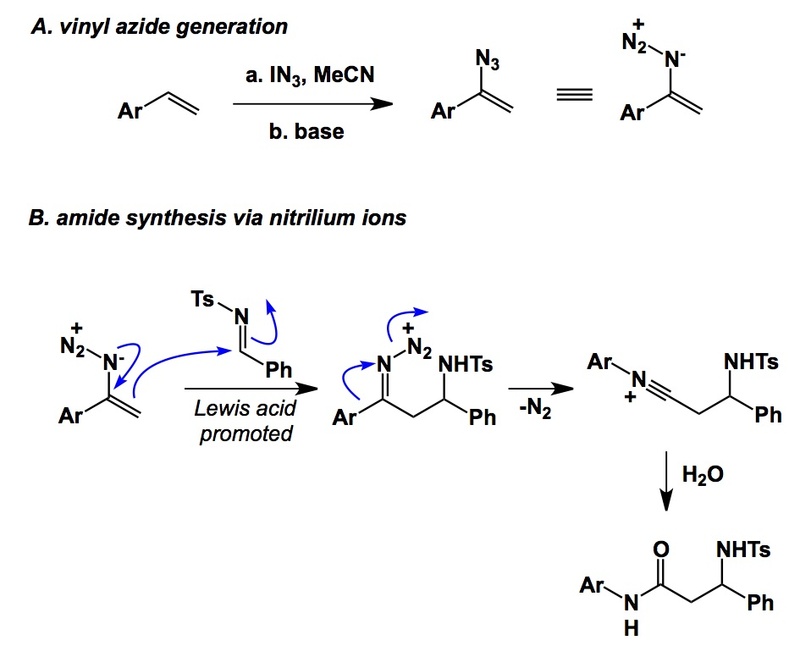 I was intrigued by Dennis Wright’s synthesis of frondosin A, presented by his student Michael VanHeyst. 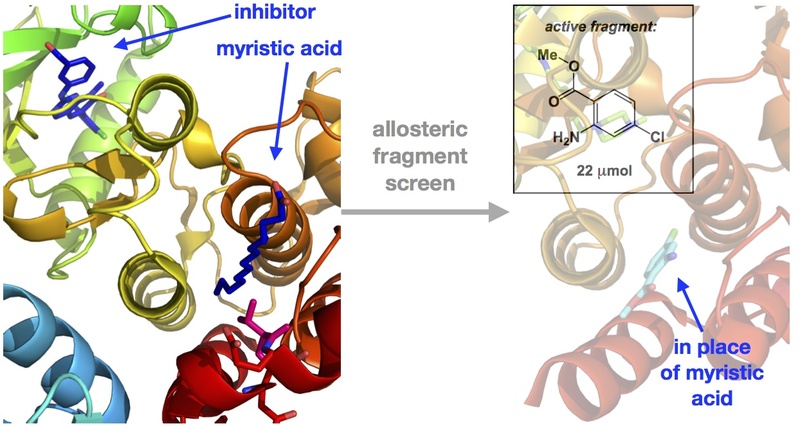 The paper describing their approach recently appeared in JACS and contains a number of clever mechanistic twists. I will comment on just one of them, as it goes well with the theme of today, which is about problem-solving. A case in point is the attempted cleavage of the oxabicycle shown below. 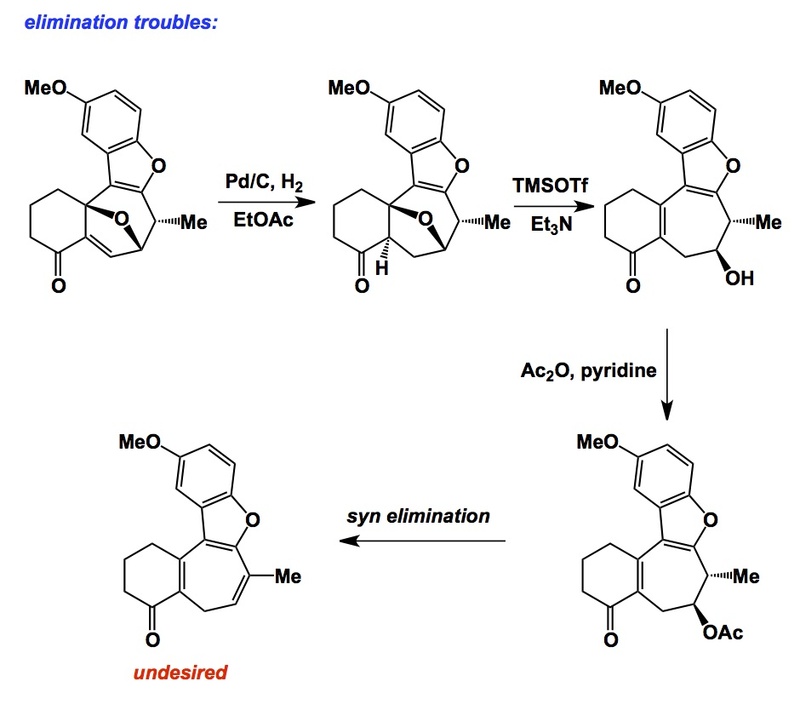 The failed attempt illustrates the capricious nature of the 7-membered ring, which leads to complete lack of selectivity during elimination. 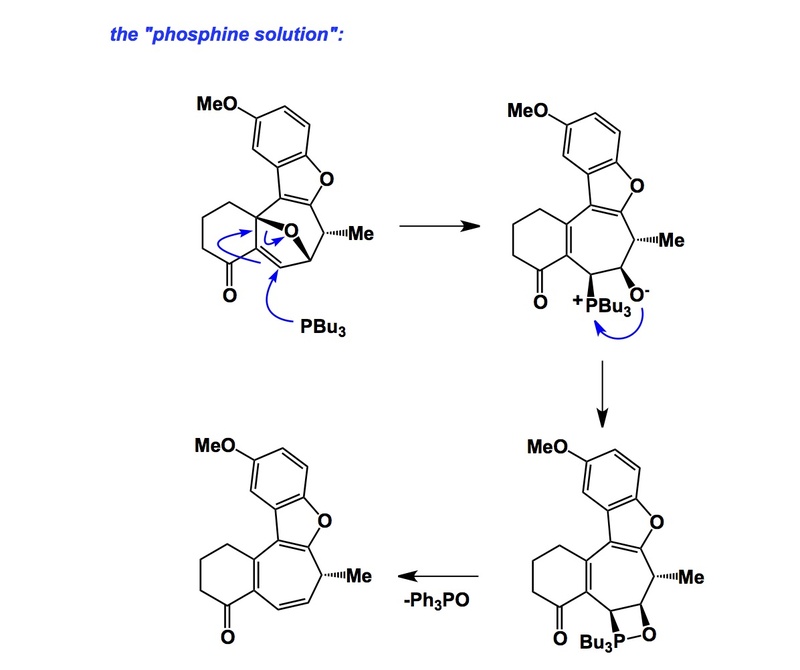 After months of trying, a reasonable solution came in the form of a phosphine-mediated rearrangement that “relayed” bonds in a super clever way that culminated in elimination of phosphine oxide. This paper also features a fascinating explanation of stereochemistry inversion that has put to rest some previous controversies. As you can imagine, some target classes are notorious for their association with scaffolds that lead to cliffs. The presence of more than one activity cliff in a given series might complicate compound optimization and turn it into a complete nightmare. This is particularly true at later stages when different molecular properties beyond potency must be optimized. Paradoxically, although activity cliffs are associated with structure/activity information, the corresponding knowledge might not be readily exploited when a given compound needs to be optimized. I think that activity cliffs really challenge the capabilities of computational approaches because the latter rarely provide good answers as far as cliffs is concerned. In broader terms, we should apply this concept in other disciplines such as catalysis. I don’t think we emphasize the cliffhanging culprits enough when we study the structure/activity relationships in ligand design.